The Northern States have seen a high Snowy Owl population this winter, the Lemming population was also high in the owls native Tundra regions. This made it possible for the Snowy Owl to move farther into the United States than normal and in larger numbers. 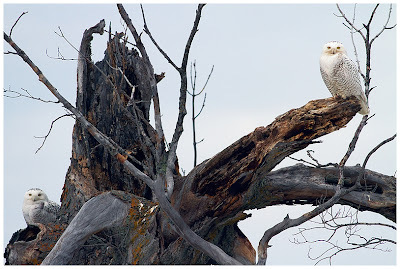 The photograph above features two Snowy Owls peacefully nesting on a tree with a grand view over a large field. A perfect place for watching and listening for pray rustling through the tall grass. This tree seems to be one of their favorite spots, each day one or two will come and perch for hours. anyone is able to watch these amazing birds if the utmost care is taken when approaching them, Owls have unbelievably good hearing and spook easily. Try not to scare them into flying away, this creates unnecessary stress for them, so be wary of this fact and keep a respectful distance. I hope you enjoy this rare look at two Snowy Owls perched and ready to dive bomb for dinner. Technical details: Canon 7D, Canon 400 F5.6L lens, ISO 320, F/6.3, 1/640th.